The Remarkable Rocks are one of the best known icons of Kangaroo Island in Australia. Perched 200 feet above the crashing sea, in the Flinders Chase National Park, over on the western side of Kangaroo Island, the 'Remarkable Rocks' are a collection of enormous eroded granite boulders sitting atop a giant dome of lava, that has been shaped by the erosive forces of wind, sea spray and rain over some 500 million years. The golden orange lichen covering some of the rocks and the many different shapes offers tourists plenty photo opportunities at different times of the day. This image belongs to the travel and nature stock photo library. This stock photo of The Remarkable Rocks at Dawn is available for licensing for commercial and editorial uses including websites, blogs, books, magazines, brochures and advertising. Restrictions may apply for images which contain third party copyrighted material or sensitive subjects. Photos of artwork are for editorial use only. 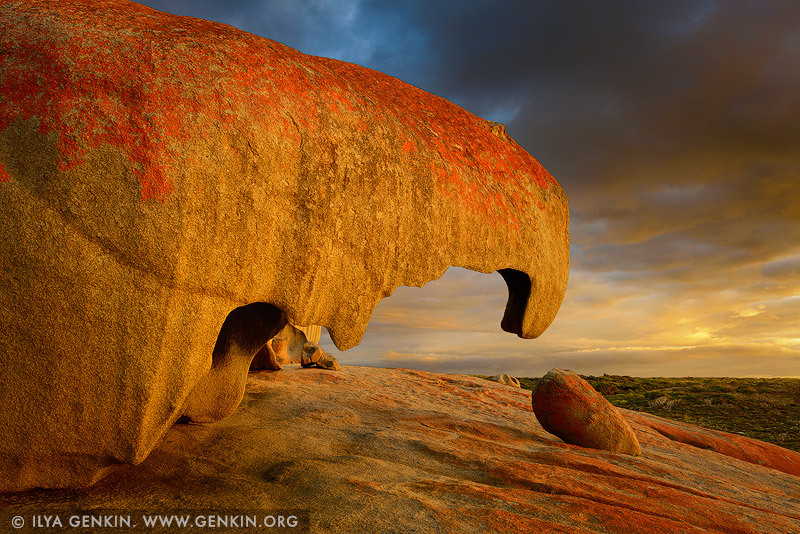 This image id KI-REMARKABLE-ROCKS-0005 of The Remarkable Rocks at Dawn, is copyrighted © by Ilya Genkin. This is not a public domain image.